What is a war bond? Governments, including the US, sell things called bonds when they need to raise money. People buy bonds to invest in a big project (like a war), and will later get their investment back with interest. 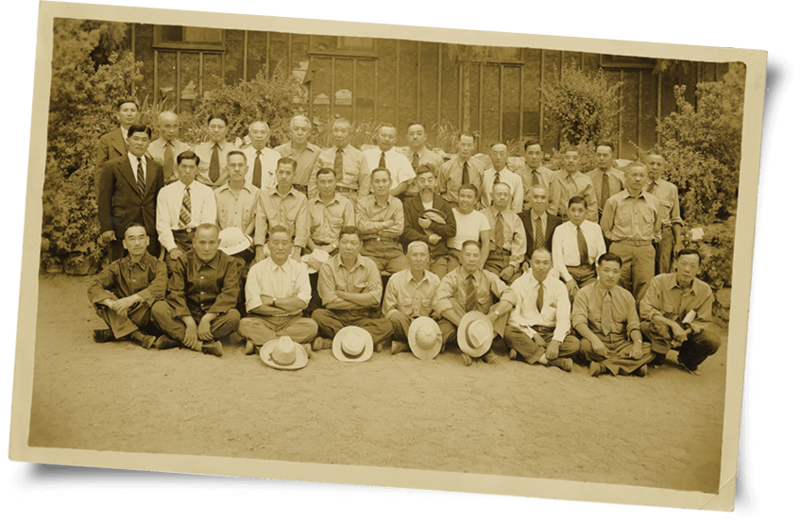 In early months of internment of people like Gihachi, he and others went before hearing boards who assessed their cases to decide whether they would be released into the general population of Japanese Americans or interned in Department of Justice camps. Initially, the government stated that internees could not appeal the decisions. The results of most hearings was like that of Gihachi: internment separate from families. However, as it became clear that these boards had been put together without much planning, and most decisions had been made in a rush and without investigating all the facts, the government agreed to re-hear the cases. December 20, 1941, Letter from Gihachi to Tsugio, Lillian, and Angela; written in English. Buy U.S. war bond much as you can and you have to show by the act that you are more faithful to this country. Though I am ditaine in jail or camp I am more to this country too because I am making living here and raised children here. But as long as I am alien he may think I am dangerous to this country that it can’t help and nothing my fault. February 23, 1942, Diary entry by Gihachi, translated from Japanese. Appear for hearing. It echoes in my heart for a long time. The hearing was indeed just a formality after all. The verdict will apparently come from Washington but I am not counting on anything. April 5, 1943, Letter from Gihachi to Lillian, written in English. I am glad that the letter you wrote to US Attorney was given consideration and they have decided that they will let me have a rehearing on me. It is good you are buying war bond every month to help the war effort and you show you are 100% loyalty to this country. December 3, 1943, Letter from Gihachi to Tsugio, written in English. But to-day I ask you do at once and write to Mr. Ennis in Washington and ask him if I am among the list of rehearing which is now going on in here. If not ask him get the rehearing on me too this time without fail. Here I can’t find out whether I am in the list or not. I can’t do anything in here concerning on my rehearing but you can do if you try to. Date unknown, Letter from Gihachi, no addressee, translated from Japanese. As I informed you 2-3 days ago, the hearings were conducted in alphabetical order, and eventually the time was up before my turn came, and the last day was the 3rd and they left. So about 160 people from N to Y were left behind without receiving their hearing. They left without saying anything about when the next hearings would take place. America is a country of asking, so if you don’t ask apparently nothing will happen. So please, you and the children must give it your all to ask the hearing people to [complete the hearings]. September 16, 1943, Letter from Gihachi, no addressee, translated from Japanese. America is a country where you have to ask, so if you don’t ask you get put off until last. Other people’s families have also been doing intense [letter writing] campaigns and recently many husbands have been paroled. Photo of men in a Department of Justice Camp. Gihachi is in the top left corner. 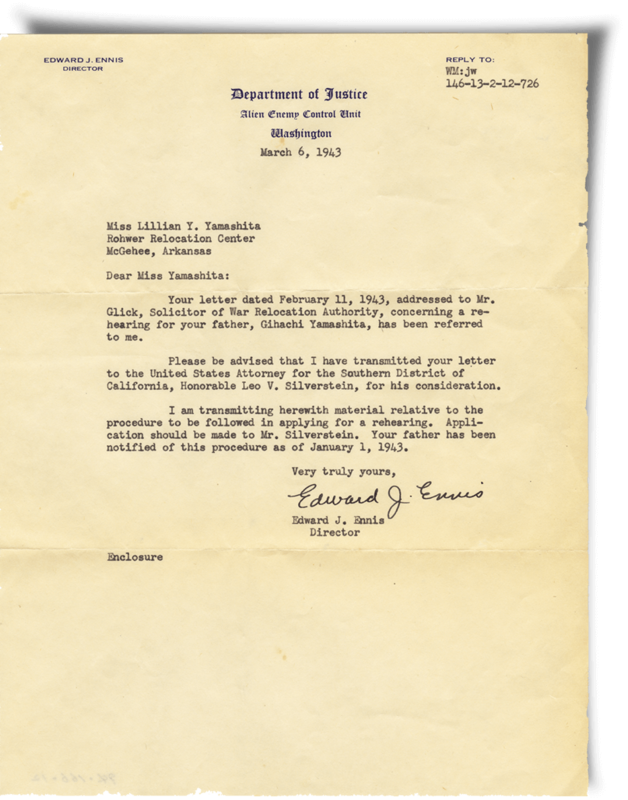 Letter from Edward Ennis in the Department of Justice to Lillian informing her that her letter was being forwarded to the appropriate U.S. Attorney overseeing her father’s appeal. 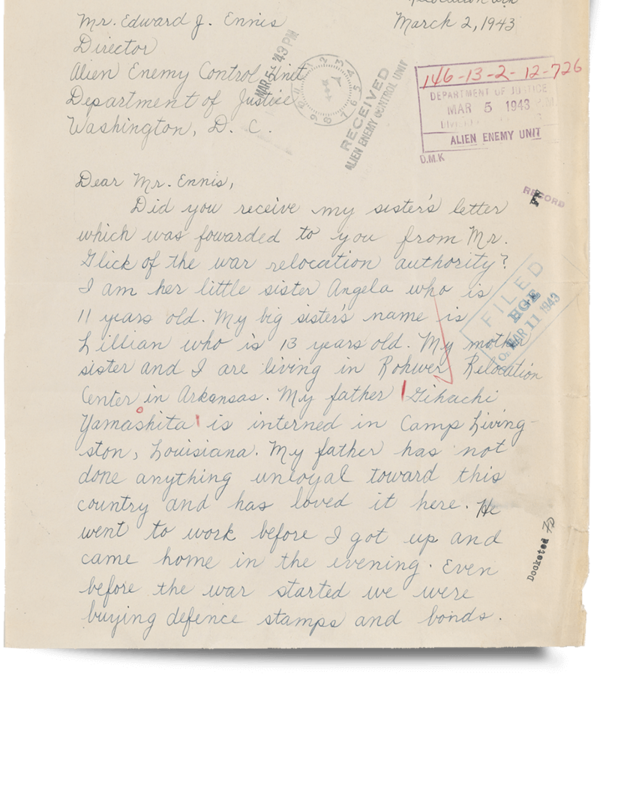 Letter from Angela to the War Relocation Authority.